It’s Fair time in Minnesota. Most people who post fair pictures on social media that show the many foods eaten at the fair. Today, when I went to the fair, I actually didn’t eat anything, although the food did smell really good! But, I did spend a couple hours looking at the projects in the Creative Activities Building. Lots of wonderful craftsmanship on display. “Bounce” – hung upside down, even though I had put a note on the quilt to designate the bottom of the quilt. Placed first in the scrap quilt category. “Window on My World” – kinda hidden in the back of the display case. No ribbon for this quilt. “Overlapping Triangles” – placed third in the pieced bed quilt category. I will post more pictures of this one once I get it back from the fair. Milano Cathedral – Not sure who the craftsperson was, but this was awesome. While I was working on the redo of my front yard, I kept thinking that stepping stones leading to the stairs would be nice. I shad seen some lovely ideas on-line that were made with glass and concrete. I really liked them, but when I realized how much the glass would cost (over $100 for the number of stepping stone I would need), I decided I would skip making them. Then, one day my sister-in-law texted me to say she was at a garage sale and the lady had a box of glass scraps for $5. After asking, I found out that it was stained glass. 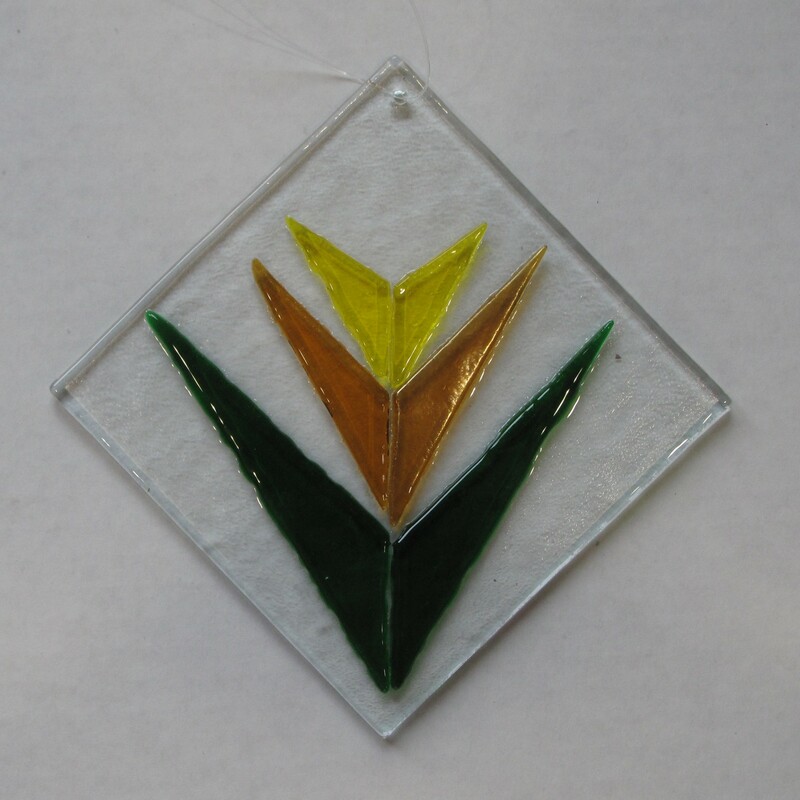 Unfortunately I can’t use stained glass for my fused glass projects (I have tried before and the glass melts poorly and has a dull, burnt look afterwards ). But, then I realized that this glass might work for the stepping stones. Not knowing what colors were in the box, I responded back to go ahead and buy the scraps – after all it was only $5. If I couldn’t use the scraps that wasn’t too much of a waste. But, if I can use it, that is a great deal for the glass. When she dropped off the glass at my home, I was amazed at how much glass was there. The box has many colors and held over $200 worth of glass. So, I decided to try making one stepping stone to see if I liked how it turned out. The first one I made was a circular stone. After cutting the glass, I used contact paper to hold the glass pieces in place. To hold the contact paper in the mold, I used spray adhesive. After mixing and carefully pouring the stepping stone concrete, I let the mold cure for two days. Unmolding was rather difficult, but once I did get the concrete out, I was really pleased with the result. So, after numerous trips to Hobby Lobby to buy more concrete mix (using a 40% off coupon each time), I made a total of three large circular stones and seven square ones. I still have a lot of stained glass left over, so I may be trying some mosaic projects in the future. In my previous post, I mentioned that the contractor building my new retaining wall made several changes to the wall design. One of these changes involved the integrated stairs. The original design, which had been approved by the city, included a landing level with the planting beds. Unfortunately, because of the change made by the contractor, the stairs were considered unsafe. I needed some type of railing or wall to keep small children from falling off the side of the stairs. The idea of putting in an ugly wooden wall or boring metal railing was not very appealing. After thinking about this problem, I came up with an idea for a trellis to be placed on either side of the stairs. These trellises would be made of cedar and copper to match one I had made two years ago for my backyard. A couple of solar caps for each side and a clematis to vine up the copper and my problem stairway was no longer a problem. I’m playing with glass again! I have read that it is best to put glass on a kiln shelf to make sure that the temperature around the glass is as uniform as possible. But, I have a small kiln with a bit over 4 inches of height, making using a kiln shelf only possible for fusing flat. Also, I have been wondering if I can “double up” and flat fuse a couple items at the same time, one on the floor of the kiln and one on an elevated kiln shelf. To test the effects of location in the kiln, I decided to make some sun catchers for my sewing room. 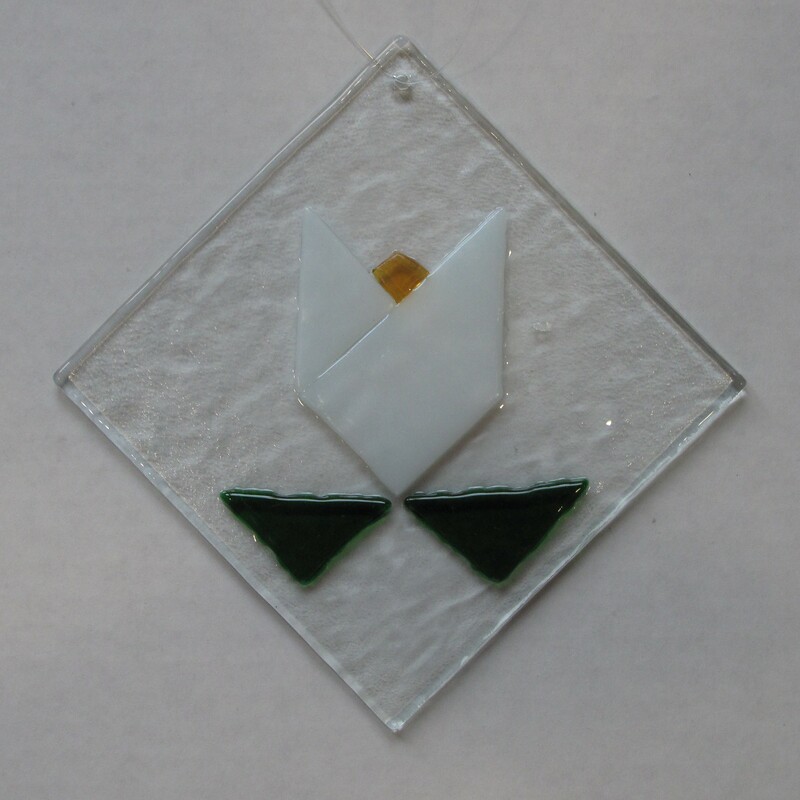 After cutting the glass pieces, I compiled one sun catcher on the floor of the kiln. Then the kiln shelf was elevated above it on 1″ posts. Two more sun catchers were put together on the shelf. The glass was fused following a contour fuse schedule. I selected contour fuse because I wanted the glass pattern be more distinct and crisp than full fuse would create. Also, I thought this temperature would better show if any differences would result from the location in the kiln. 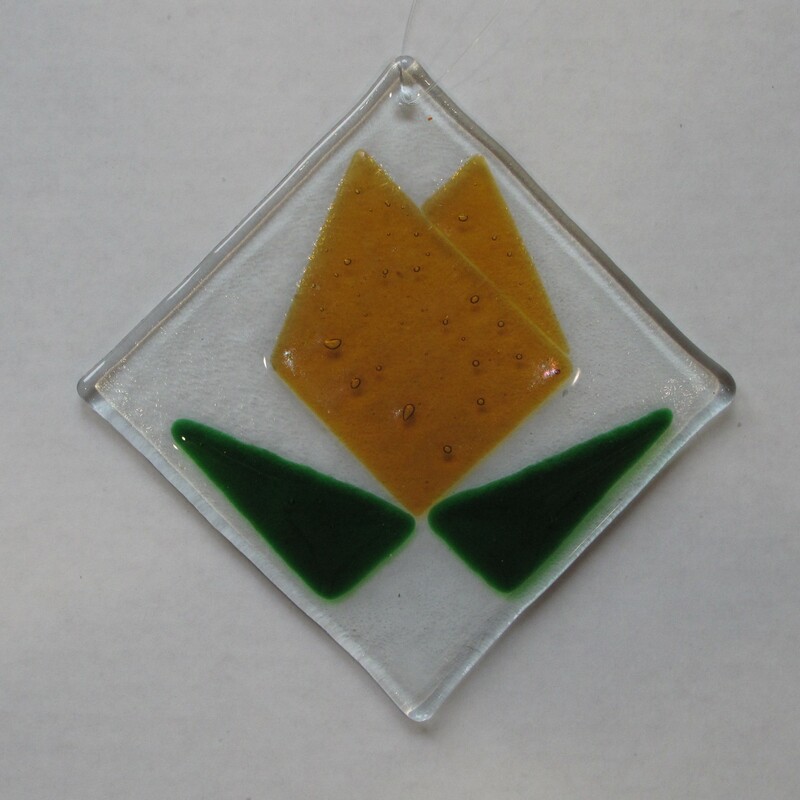 What a learned was that placing glass directly on the kiln floor caused the glass to reach a higher temperature. The sun catcher fused on the floor of the kiln was closer to full fused and lost much of its defined lines. Still pretty, however. 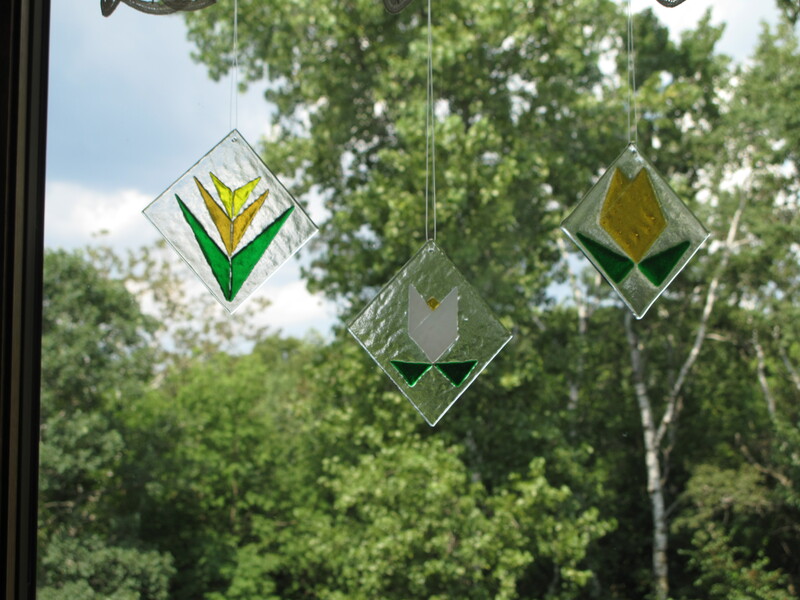 The two sun catchers fired on the kiln shelf were truly contour fused – defined glass edges but nicely smoothed. These are now hanging in my sewing room window. I think I may actually make some more soon for the other window in the room.